Ensure your dog’s general healthcare is up to date, in particular vaccinations (including for heartworm which is now prevalent in the US) and that your dog has recently been wormed. If your dog takes any regular medication for ongoing conditions e.g. anti allergy tablets, then ensure you have had a recent review with your vet. Mention you are planning to take your dog on holiday and check your medication stocks are sufficient to cover that period of time. Also, ensure any veterinary insurance policies are up to date and pack the policy details, contact phone number and your veterinarian’s contact details. Alongside this paperwork you could also pack any medication supplies at this stage to cover the holiday period. Pack enough of your dog’s regular food to cover the trip (dry kibble food is more practical) and ensure the container used is secure, as many dogs are food crazy and finding a large source could lead to bloat and an emergency health situation. On the same note, keep human food securely packed and try to only bring out food at meal times, keeping your dog safely away from the camping stove. You could also pack a few dog treats, securely packed. A travel dog water container (for long walks etc) and a large water container and bowl would also be required to cover your dog’s drinking needs. Your dog’s collar and leash should be checked to make sure they are in a good condition before the trip. You might want your leash to be a longer length to allow for the right blend of freedom and safety when exploring new locations. Check your dog’s name tag is securely attached to his/her collar, your contact details are fully up to date and the engraving is still easily readable. You may also need a crate or smaller dog tent to ensure your dog is fully secure at night, especially if you are planning to let him/her sleep in the porch area of your main tent. Ground spiral stake anchors are also useful to safely secure your dog for short times, perhaps whilst you are cooking. You will also need dog bedding for comfortable sleep times and, of course, plenty of poop bags. Once your dog has been camping with you a few times you will find you can very quickly throw together your complete checklist and head off to enjoy the outdoors! Check out the many beautiful campsites that are happy to take doggie guests. Whether alone with your canine companion, or as a family complete with pooch, your holiday will be so much more fun with a doggie focus. 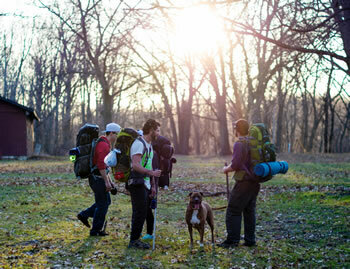 This entry was posted in Guest Blog, How To and tagged camping, dog by admin. Bookmark the permalink.